Just like you, your dog can get cold outside and may enjoy the comfort and warmth of a sweater. While it may take a day or two of use for your dog to get accustomed to the sweater, it benefits from being warm during cool outdoor walks. Measure and write down the following lengths on your dog's body: from the jaw or cheek to the depth of the chest at the breastbone, from the spine to the center of the belly just after the shoulder, and from the ears to the rump just before the tail begins. Use the diagram as a guide to create a pattern with your newspaper following your measurements. It's easiest to start with point number one, followed the straight lines to points two and three. After marking point four, freehand draw the curving of the pattern along the belly line. Cut out your pattern and set it over a folded portion of fleece aligning the fold line of the pattern. Cut out two pieces of fleece and pin together along the edges with the right sides together. Sew along all of the sweater's edges but leave open a 6-inch gap along the tail end. Turn the fleece inside out to put the right sides on the outside and stitch the gap closed. Fold down the sweater's neck by about 2 inches along the back to create a collar. 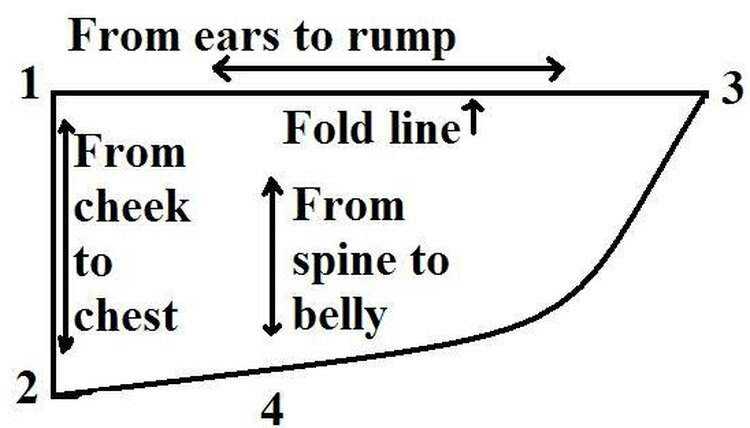 As the collar comes toward the dog's chest, it should gradually get narrower to as little as 1/2 inch at the front ends. Sew the collar in place along the edge of the fold. Making the collar creates the tabs that cross in front of your dog's chest. Place the sweater over your dog and match up the front tabs, which should overlap. Find a position that is comfortable for your dog and pin Velcro strips horizontally onto the flaps where they will overlap. Sew the Velcro strips onto the sweater to secure. For a more fitted look, use Velcro strips sewn to a few wide, elastic strips along the belly of the sweater. To make a lighter sweater for fall or spring days, use only one layer of micro fleece fabric and sew a stabilizing stitch around the edges. If you have dogs that are different sizes, label the current pattern with the dog's name. A different pattern for each dog will allow you to make more sweaters for each that fit properly. If at any time it looks like your dog is significantly bothered by the sweater or is being choked, remove the sweater and readjust it for a more comfortable fit. Never use buttons or pins to fasten your dog's sweater because they may end up getting chewed off and potentially swallowed.